Easily make this traditional Korean condiment in your own kitchen. Necessity is the mother of invention. If you are Kheedim Oh, so are cravings. When he couldn't find satisfying kimchi—a traditional fermented Korean condiment made with cabbage, cilantro, and green onions—in stores, he decided to consult the chef of his favorite version: mom. 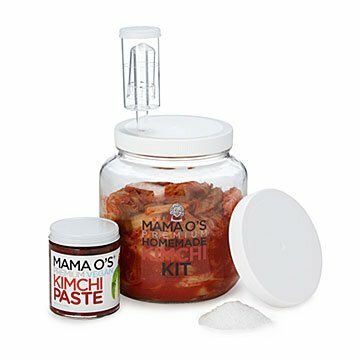 Oh then decided everyone deserved good kimchi, so he created this kit, which allows you to easily make your own at home. Serve it as a side dish, or pile a spoonful or three on top of rice, soup, tacos, or even burgers. It's also packed with probiotics, which help with healthy digestion. The kit includes gloves, sea salt, airlock, airtight lids, and a jar of signature vegan paste that is handmade by kimchi craftsmen in Brooklyn. Nobody knows that I'm making kimchi, they can't smell it!!! I really find that everything is great about this product. There is a Korean market not too far from my house, but the only kimchi that they sell is the really hot kind in a glass jar, all of the rest come in plastic containers, so I'm really glad that I can make kimchi to my own taste, in glass, and save a ton of money! I think that the kit has already paid for itself, and I'm just getting started. I opened it to find both jar lids were broken. Very disappointing as I'm not sure if I can find any replacement lids. Usually he buys store bought Kimchi but this allows him to experiment adding different ingredients for different flavors and my 3 year old grandson loves to help him create yummy, healthy and vegan dishes. Yay, perfect size for a couple of Kimchi lovers! This is a great way to make Kimchi @ home, with little mess, or storage problems. Great packaging Great set to introduce someone to homemade kimchi making Not a fan that they don't teach you how to make the paste that is required; instead you're required to replenish from their website. The set is already overpriced so this was inexcusable. Teach a person how to fish if you're gonna charge that much for the set.